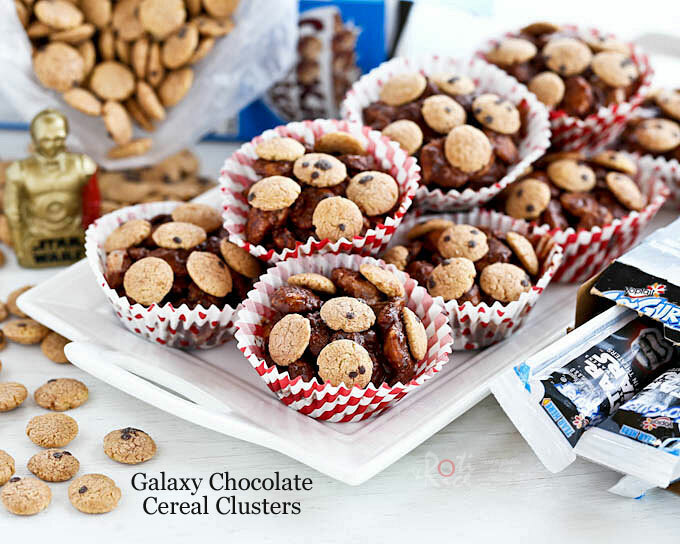 These crunchy and super tasty Galaxy Chocolate Cereal Clusters are perfect for your next viewing of Star Wars™. It is hard to stop at just one! Ro-Ri San once said, “Any year with a new Star Wars™ movie is always a good year!” The last time we had a premier of a Star Wars™ movie was ten years ago. It was the first time our two boys actually went to watch a new release of that series and it literally bowled them over. The opening sequence had the two warring star fleets slugging it out over the stratosphere of the capital planet. Watching the star battle on wide screen magnified the experience many times as the boys had only seen the previous movies on television screen. Since then, our family has been constantly hoping for a new movie release, and 2015 is THE YEAR. It is a good year. So, to celebrate the upcoming Star Wars™ movie, I am making a special treat that will knock the socks of any power-filled galactic trainee warrior. 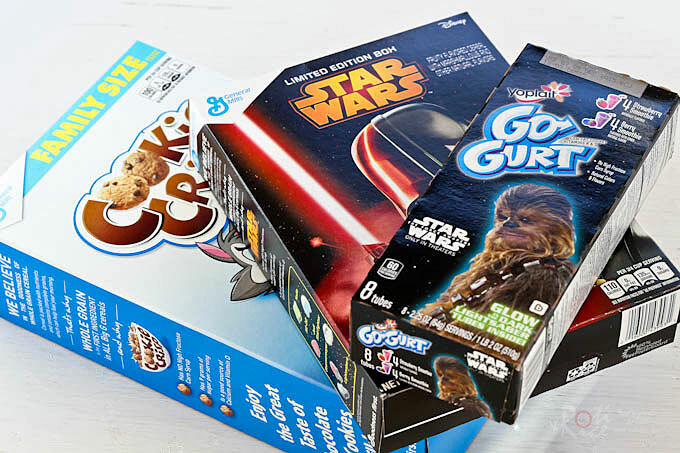 These young guys need lots of energy to light up their beam weapons, so nothing like some Star Wars™ Cookie Crisp from General Mills to kick our kitchen into high gear. 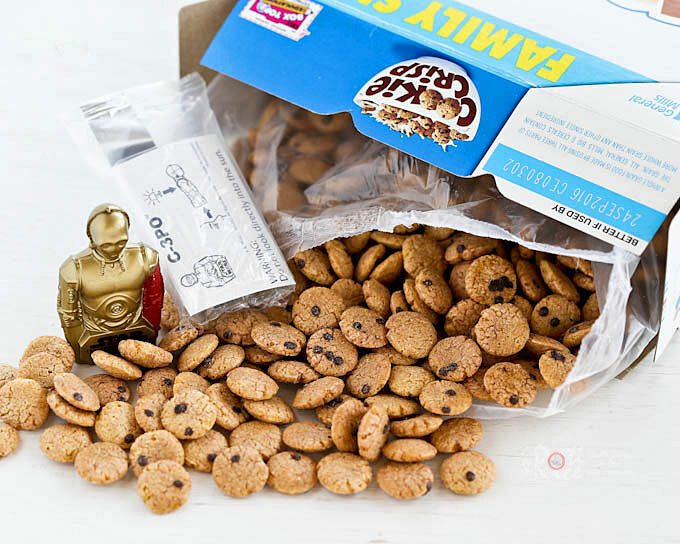 Incidentally when I opened my box of cereals, along came a toy of a certain golden robotic personality recognizable to all Star Wars™ fans. If you peek through the view hole, you will get to see a surprise image from one of the movies. What fun! Something interesting for the little trainee warrior in your life. Collect all 6 viewers found separately in each cereal box. Hurry to get them or you will find yourself haggling with a big nose winged character who runs a junk yard store on a desolate desert planet on the outer edges of the galaxy. Once the troops came home from the daily grind, they were delighted to find these Galaxy Chocolate Cereal Clusters all ready for afternoon tea. For something that is relatively easy to prepare (of course it helps to have an energy Light Spatula), the results are pretty spectacular and suitable for all kinds of occasions. With these super galactic treats, you are ready for the next adventure whether your guest is humanoid, alien, or a robotic personality. Place 16 regular size cupcake liners on a tray. Toast chopped pecans in a pan for about 3 to 4 minutes. Remove and allow it to cool. Combine 4 cups Cookie Crisp cereals, bittersweet chocolate chips, toasted pecans, and non-fat dry milk powder in a large bowl. Stir to mix. Melt butter in a large non-stick pan. Add marshmallows. Stir to melt the marshmallows. Turn off stove and remove from heat source. Pour cereals mixture into the pan. Stir to melt chocolate chips and coat cereals and nuts. Divide mixture evenly into cupcake liners. Compact mixture using a spoon. Top each cluster with 5 to 6 more Cookie Crisp cereals from the remaining cup of cereals. Refrigerate for about 20 to 30 minutes to allow mixture to set. I am excited to see what you will be creating for your Star Wars™ movie night. 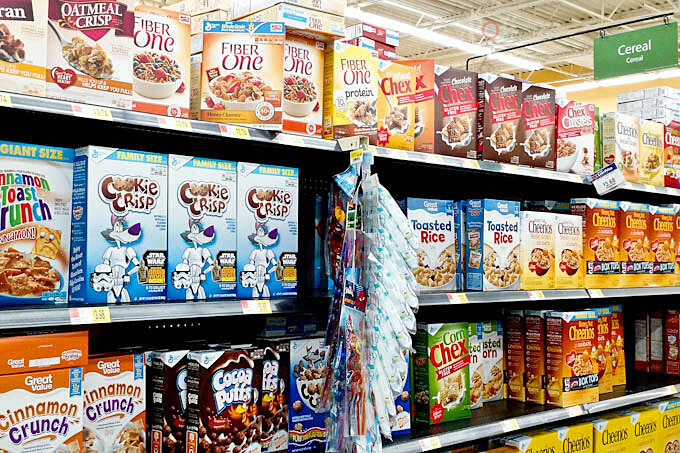 Be sure to check out the different kinds of cereals available at General Mills. How cute are these! They would make for such a great kids snack! My nearly 4 year old would go nuts for these. I might just have to make them for him! I hope you will, Kylee. They are a great snack, if I can say so myself. Thanks for visiting! These look so cute and delicious! I’ve made marshmallow treats before, but these look way better. 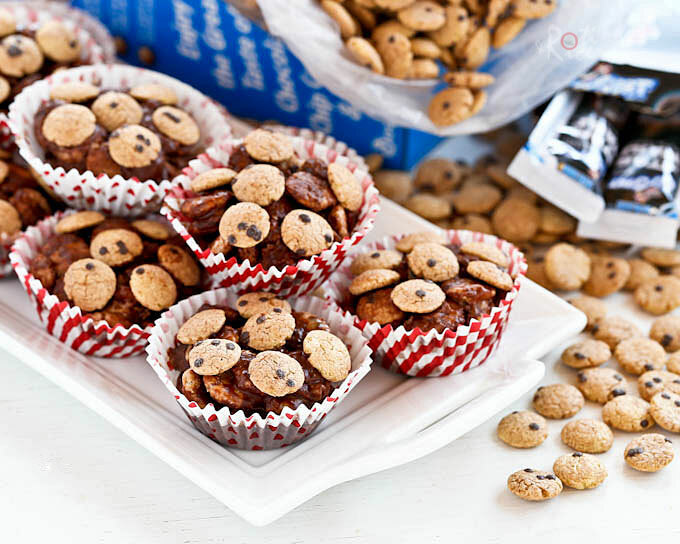 Im loving the addition of pecans and the use of cookie cereal! This is such an awesome idea!! 😀 I could probably go through an ENTIRE tray of this in one go! I need to get my hands on Galaxy Chocolate Cereal! 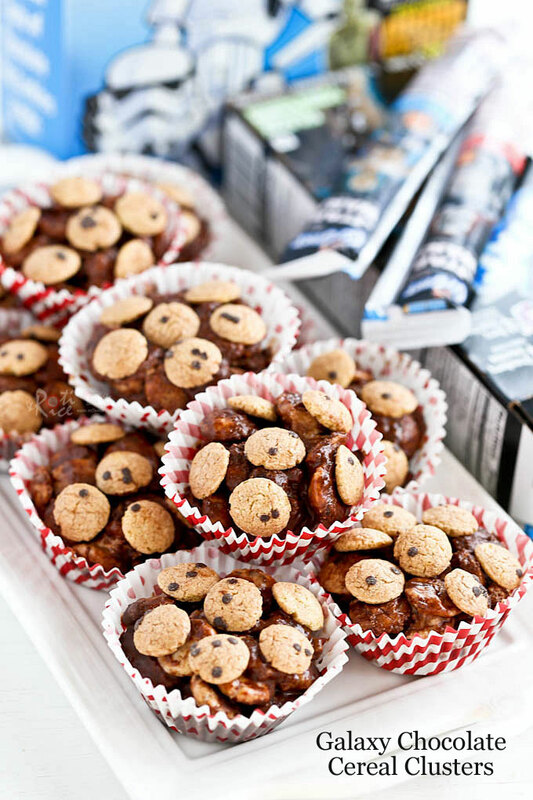 Oh me oh my…these would be a hit over here as we are Star Wars obsessed! I’m going to have to find a way to make these plant-based! Im thinking Im going to make this when we are standing in line for the new star wars next month! Awesome!! Thanks Michele! That would be perfect as they are great on the go. These are too cute! I love the little C3P-O! !